This spicy pork ragu, Pork Arrabbiata, cooks low and slow in the oven until fork tender, with a tomato gravy and lots of red pepper flakes. 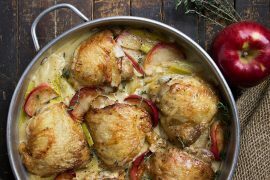 Before low and slow cooking season leaves us, I did want to share this delicious dish. 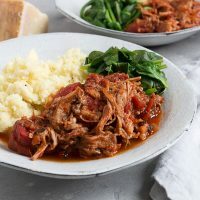 This Pork all’Arrabbiata starts with an economical pork shoulder roast and cooks low and slow with fire-roasted tomatoes, red wine and a healthy dose of red pepper flakes. That’s where the “Arrabbiata” (translated from Italian it means “angry”) part comes in. 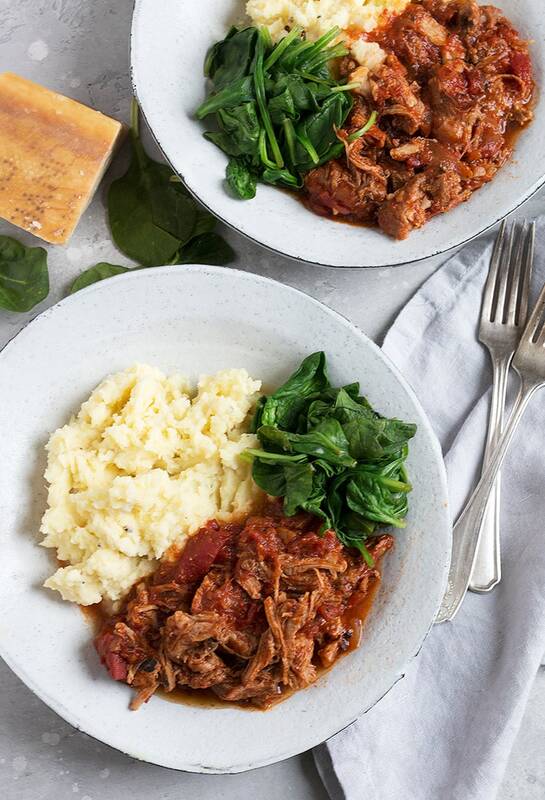 This versatile, spicy pork ragu can be served as I have here with mashed potatoes or over pasta or polenta. You could also swap out the mashed potatoes for a cauliflower mash. I’ve dressed up the potatoes with a bit of garlic and Parmesan cheese, which complements the meat perfectly. (You could do the same with cauliflower, too!). 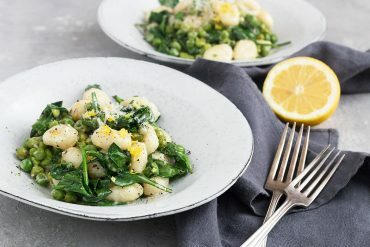 A little quick sauteed spinach and you have a lovely bowl of comfort food. You can start with a boneless or bone-in pork shoulder. If bone-in, just get a slightly heavier one to account for the weight of the bone. In either case, I always cut off any large fat cap on the roast, then cut out the meatiest bits and then cut into chunks as needed. You want some fat, but generally you want to leave most of the larger pieces of fat behind. If using a bone-in pork shoulder, cut around and discard the bone part before cooking. Fire-roasted tomatoes add great flavour to this dish. I love the Muir Glen brand, which are quite easy to find in both Canada and the US. If you can’t find, regular canned diced tomatoes are fine. Adjust the amount of red pepper flakes to your taste. Adding 1/2 tsp will give you mild heat. 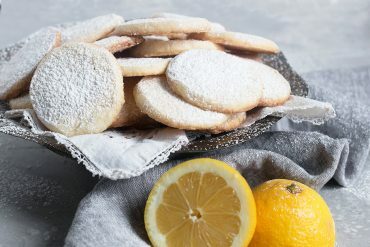 1 tsp is moderate or add 1 1/2 tsp for a good bite. Top Tip! When cooking pork shoulder, you will inevitably need to deal with some of the fat that cooks off. Here’s a neat trick for scooping it off easily! Use a spoon to move the pork mixture into a pile on one half of the pot. Let stand 5 minutes or so. All the fat should have flowed to the empty side. Scoop off the top of the pile of pork. Make another pile further over. Let stand 5 minutes then remove all the pork, leaving the fat in the pot. 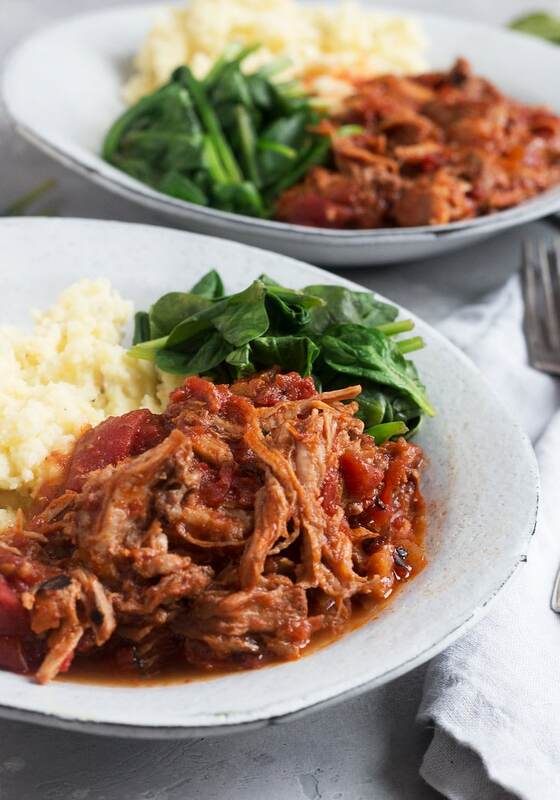 Pork shoulder cooked low and slow with a spicy tomato gravy. Served with Parmesan mashed potatoes. Alternately, serve over pasta, polenta or cauliflower mash. Season with pork cubes with salt and black pepper. In a large Dutch oven over high heat, heat the olive oil. Add the pork and brown on all sides, about 8 minutes. Transfer to a plate. 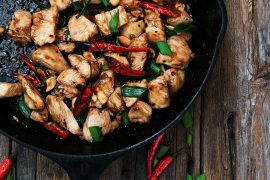 Remove the fat from the pork: Using a large spoon, move about 1/3 of the mixture into a pile on one side of the pan. You can even elevate the piled end slightly by tucking a pot holder under that end. Let stand undisturbed for 4-5 minutes. The fat from the stew should run into the empty part of the pan, where you can spoon it off and discard. About a half hour before your pork is done, make the mashed potatoes: Peel the potatoes and cut in half. Add to a large pot and fill with water. Add some salt to the water. Add the smashed garlic cloves to the water. Bring to a boil and boil until potatoes are tender, 15-20 minutes. Drain potatoes and return to pot. Place pot over medium heat on the stove-top. Add the milk and butter to the pot. Mash potatoes with the butter and milk, adding more milk as necessary to make a smooth mash. Add the Parmesan, a healthy sprinkling of salt and lots of freshly ground pepper. Stir to combine. Taste and add more salt and pepper, as needed. 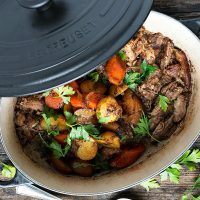 This Marsala Braised Pork with Carrots and Potatoes is both easy and delicious, with fork tender pork and vegetables made all in one pot. 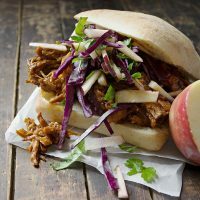 With delicious pork cooked low and slow, these sandwiches are full of flavour and hearty. 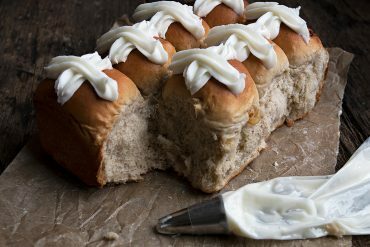 Served on a crusty roll and topped with chopped cabbage and apple, they are perfect for feeding a group! Thanks tour and you, too! Hi Jennifer. 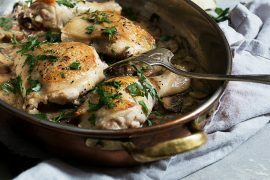 After searing the pork, could the whole lot be done in a slow cooker? Hi Glenn and yes, you absolutely could, as the slow cooker provides the same cooking environment as a covered pot in the oven. I use the standard 4 hours on high/8 hours on low when it comes to the slow cooker, generally. It might be a wee bit shorter for this one. (I’d peak at it earlier to check). Turned out brilliantly Jenn. 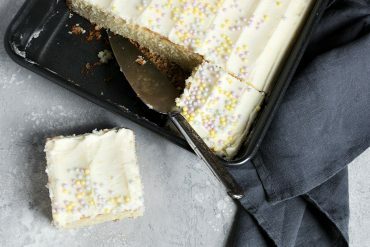 Absolute winner recipe. We added a teaspoon of sour cream to the mix just to balance out the tomato acidity, but that’s probably more of a personal preference thing. The recipe itself is outstanding! 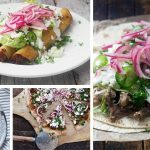 Love this recipe – pork shoulder is my favorite cut and this version of it looks scrumptious. And all the red pepper flakes and the fire roasted tomatoes, mmm. Is there anything more savory and delicious than pork cooked low and slow? This meal has my name written all over it!! I don’t think there is, Annie :) Thanks! 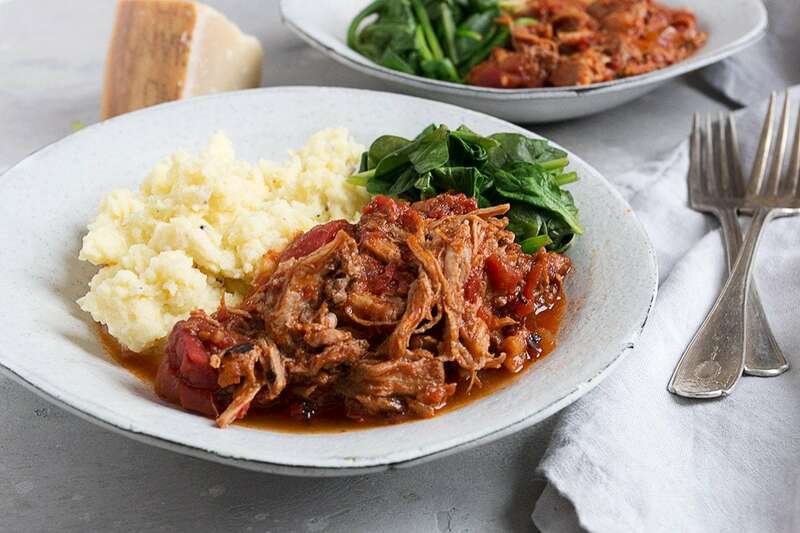 Your pork ragu sounds delicious…I think I’ll serve it with some soft polenta. Yum! Thanks Karen and yes, perfect with polenta! I’m not one of those people who refuses to use my ovens during the spring or summer, so low and slow season is basically year around over here! Which is great news for me, because that means I get to eat this cozy pork 12 months a year! YES! This looks just delicious, Jennifer!!!! My mouth is seriously watering! A definite MUST TRY! Cheers! This sounds so good and so easy! 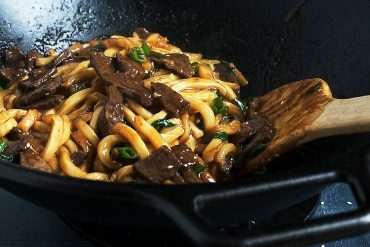 A new dish to add to our repertoire! You had me at tomato gravy! This looks so delicious Jennifer and I bet the aroma practically tortures the family while waiting to dig in. So good. Low and slow cooking season will continue here Jennifer. This is a meal that would be a winner at our house. My husband would enjoy it just as you’ve served it. We both love spicy, so arrabbiata has always been a fave. 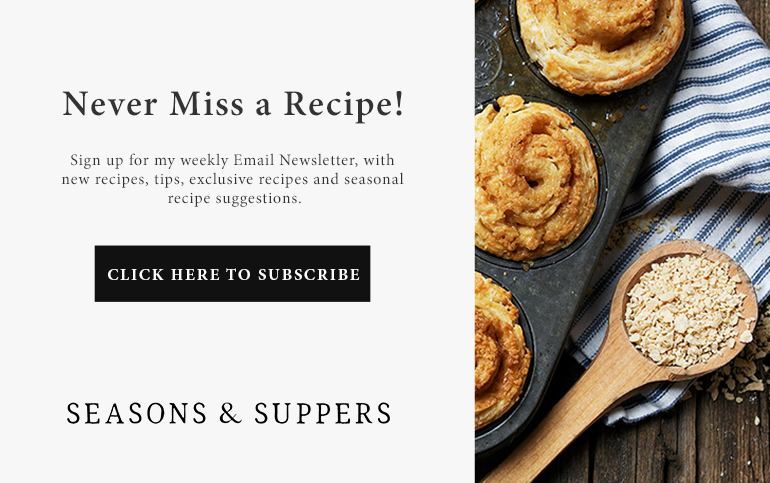 Can’t wait to give your recipe a try!